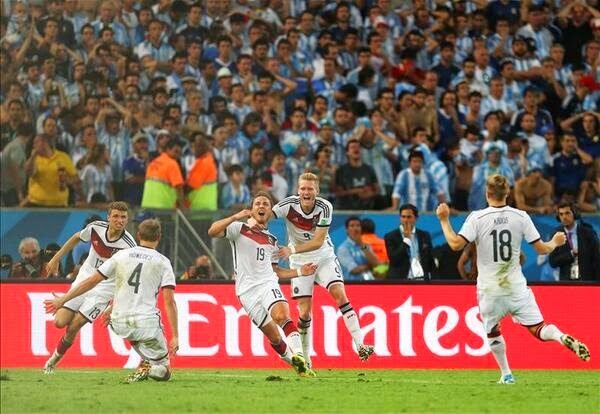 2014 World Cup Final between Germany & Argentina, a recap of all the action. The game started in a very dynamic way, with both teams looking for a goal and a lead in the game. Argentina had Messi deep in the midfield, trying to control the ball and start the attack from a deeper part of the field instead of having him up front with his back to the net. Germany on the other hand was defending with close lines and had their back four pushing up against their midfield players. Lahm had tons of space on his side of the field and was from him and his right side of the field that the best scoring opportunities came for Germany. Their left side is nonexistent. Argentina was never able to really shut down Germany’s right side and Rojo is having a lot of work on that side trying to stop Germany’s incursions into their attacking half. Was on that side of the field that Kramer got an elbow to the face in play with Rojo and Garay, and he had to be replaced by Schurrle. Kramer looked like he didn’t know where he was. Disappointing for the young man, he made it to the final due to Khedira’s injury and now sees himself pushed out of the biggest game of his life due to injury. Germany dominated possession with 63% and was controlling the game during the first forty five minutes of play, but the two best chances of scoring came to Higuain and Argentina. The first was a horrible back pass from Kroos that gives Higuain a one on one with Neuer and the Argentinian forward shoots it wide. Incredible how he missed the net when he was alone with only the German keeper in front of him. The other was a great cross from the right hand side, Higuain scores what looked to be the opener but he was offside. He finally finished a cross in true forward finish and the goal was disallowed for offside. Poetic justice for Higuain. The first half ended at 0-0 but it was a very entertaining first half with both teams playing a very good brand of football. Second half started with Messi almost putting Argentina in the lead but it wasn’t meant to be. The first 15 minutes of the second half saw a more assertive Argentina, trying to get a goal and shake off the pressure from Germany. That ability to control the ball and the game would only last 15 minutes and then we were back to having Argentina too far deep in their own half, waiting for a mistake so they could counter attack and Germany playing their own version of tiki taka. The game became really cagy with two teams fighting for the ball in the midfield but without enough quality or ingenuity to use that possession to create quality passes moving forward. Argentina would have Messi playing so deep that when he got the ball he was too far from any of the Argentinian forwards, making him unable to connect the Argentinian midfield with the forward line. Germany zone defense was effective in stopping him as well, with two players coming to his area every time he would touch the ball. The Germans were not connecting their final pass and that was a frustrating sign for them. All of their play forward was wasted on poor final passes into the box, easy for Romero to gather or the defense to clear. So it was no surprise that the first half ended in 0-0 and the game was going into extra time. We would see 30 more minutes so they could try to find a winner before penalty kicks. The first 15 minutes of extra time didn’t add anything to the game. Besides an early chance by Schurrle that came close of scoring in the first minute, the rest of the half was of long balls looking for a dashing run. Both teams, seemed to just want the penalties to come, or a mistake by someone added with a stroke of genius. Mistakes were not abundant and the genius had been quiet for almost all game. At the end of the first half of extra time it was still 0-0. The second half of extra time would start just like the first half had had ended with two very cagy teams battling in the midfield. That was until Schurrle took a ball down the right side crossed it to Gotze that chested it down beautifully and shot it passed Romero to finally open up the score. It was 1-0 for Germany with 7 minutes left on the clock. 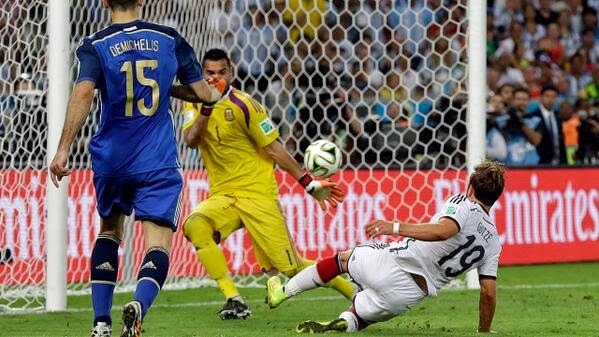 You had the feeling that this one goal was going to be enough to give the Germans the win. Argentina looked out of gas and Messi had been missing for the duration of the match in what was his worst performance at the World Cup this year. Very disappointing from an Argentinian perspective and I am sure for him from a personal perspective. In the end Germany would in the match 1-0 and become the first European nation to win a World Cup in South American soil. We all had Germany winning but only Iain had the exact result. Iain was the most consistent of the three through out the knock out stages while Pedro dominated during the Group Stages.